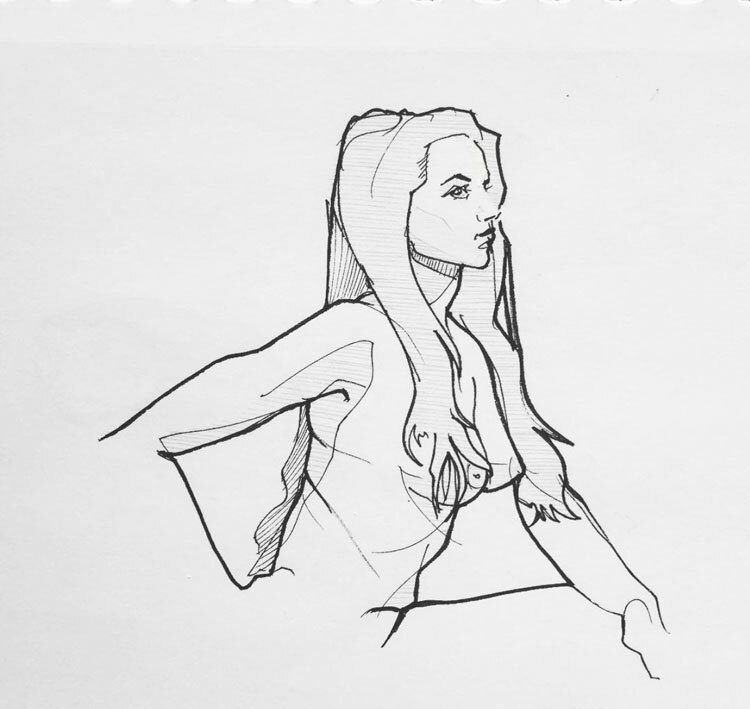 Lets break down the figure drawings of Chris Glib, and see what we can learn for our own drawings. 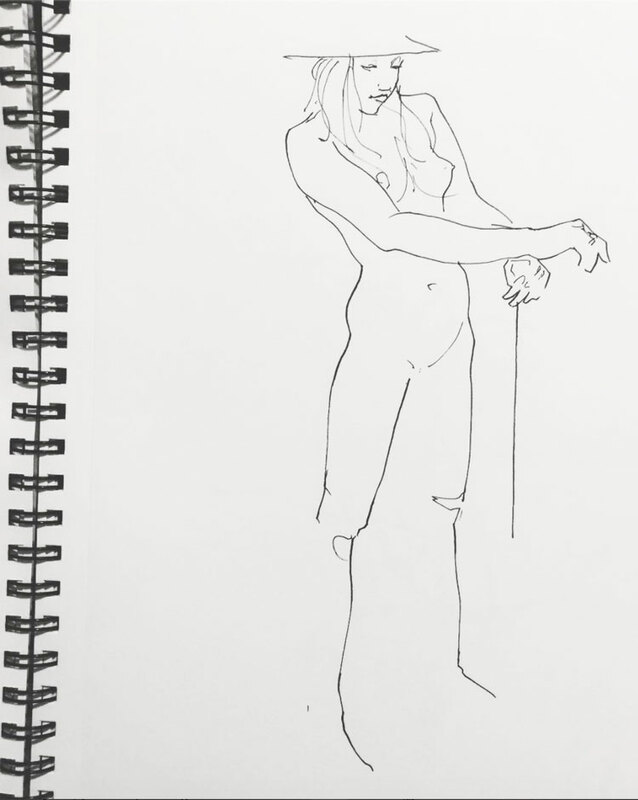 You can see Chris’ figure drawings on his Instagram account – @chrisglibart. Big thanks to Chris for giving me permission to make this video/article, and for answering my questions about his drawings and his process, which I’ve included later in the video/article. Chris draws with fineliner pens. A lot of the drawings are 10 to 20 minutes, with some quicker ones thrown in too. Ok, lets get into it. The thing about Chris’ drawings is that you shouldn’t just learn from what’s there, but also from what’s not there. Fineliner pens create lines of relatively uniform weight. 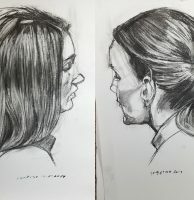 There isn’t too much scope for varying the thickness or the intensity of the marks like you could with charcoal or pencil or a brush or a pastel. He might use a couple of pen thicknesses, but that’s all the variation he has. He could try to work around the limitations of the fineliners, for example using complex webs of crosshatching to show the gradual change in the tones across the figure. But he doesn’t work around them, instead he leans into his material’s characteristics, and that’s where his drawings become so fun. 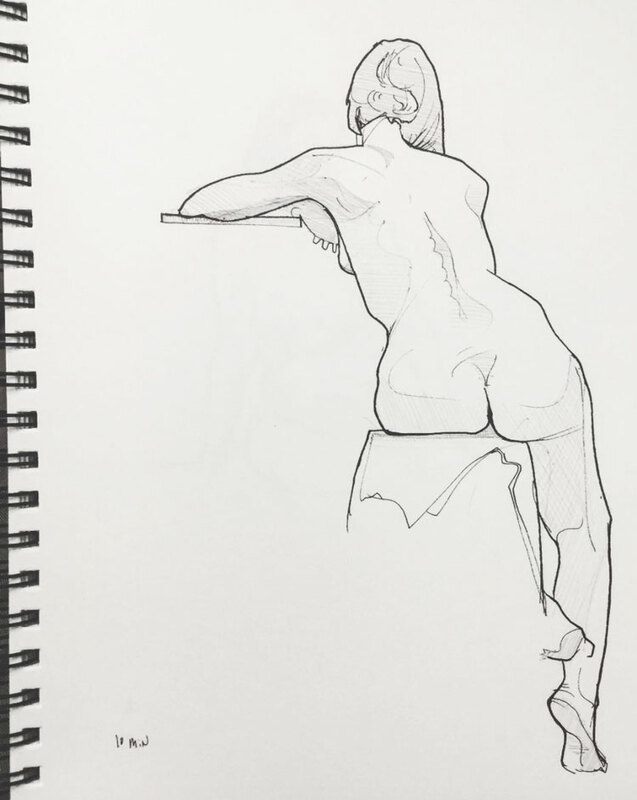 He draws contour lines that describe the big shapes in the figure. These include the outline of the figure, as well as lines within the figure that tell us about major changes in the plane of the figure. In other words, when this part faces this way, and this part faces that way, he gives us a line to explain where these two planes meet each other. Why use two lines when no lines will do? Drawings become so enthralling when there’s missing information for you to fill in. A bit like how if you over-explain a joke, it’s not funny anymore – your mind has to make some of the connections. Here, we only need to understand one edge of the leg – the rest of its volume we can fill in. That edge we do get though needs to reflect the big shapes in the leg. With this hand, he’s giving us the outline of the whole thing. Then he’s added the plane of the back of the hand, so it becomes 3D. The outline and this shadow shape tell us where the first knuckles start and the second knuckles end. Since we can see those, we don’t need lines separating the fingers. This is all on one plane, we can see where the fingers are bending, we can see where the plane shifts to become the back of the hand. Little bit of negative space to explain that this finger is different to the others. Our minds can do the rest. There are other changes in the planes, but not top priority, so they don’t get lines. He keeps things looking clean and crisp by using only single parallel hatching, not cross hatching or contour hatching. He usually only gives himself one density of hatching in a drawing. He doesn’t have more dense hatching for darker bits and thinner hatching for lighter tones, to help explain more to our eyes about the figure. Since the shading is all at one level, It’s not going to be gently transitioning from dark to light. It will have a clear shape with an edge, and Chris will often draw that edge to nicely contain the hatching. That edge will also tell us a little more about the form. The contour lines tell you about the form, so actually even the hatched shading part isn’t essential. 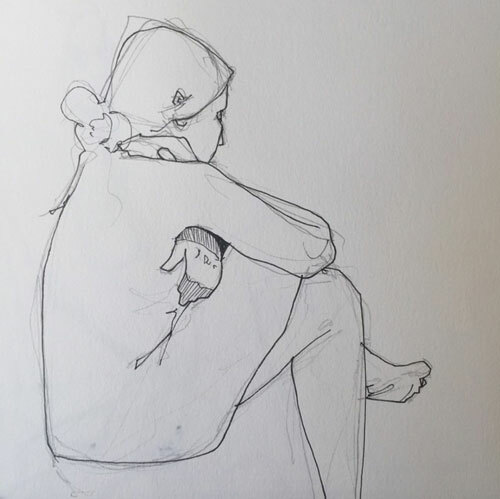 In some drawings, even the hatching is left out. Ultimately, it’s only the most important shapes of the parts of the figure important to the composition that really need to be in the drawing. If those are right, it’ll look good. Even the light and dark aren’t essential. It’s almost like Chris is pushing the limits of how little he needs to capture the thing about the figure and the pose that he loves. Chris is still minimalist with his lines in the hair. He has lines to show the big shapes, and then sometimes a few lines to explain the texture. Now you have the shape and texture, you can fill in the rest. Some artists will under-emphasise non-focal areas – reduce contrast and detail – and then bring attention to focal points with contrast in value, contrast in warm and cool colour, sharp edges and more detail. With Chris’ minimalist style, he can just leave out the parts of the pose that aren’t interesting entirely. So what you see is the focal point, and even then, a lot of that you have to fill in with your mind’s eye. We often talk about varying line weights. It’s great to not have a monotonous line, but to have thinner lines and thicker lines, even in the outline. Often it’s nice to use lighter weight lines on the edges where light is falling, for example, to make that edge feel lighter. But like I said earlier, Chris is more concerned with form than light, and he likes a powerful, clean container to wrap the form in. So he often uses a thick, uniform line around the whole figure. He’ll then use the thinner weight pen for contour lines within the figure. 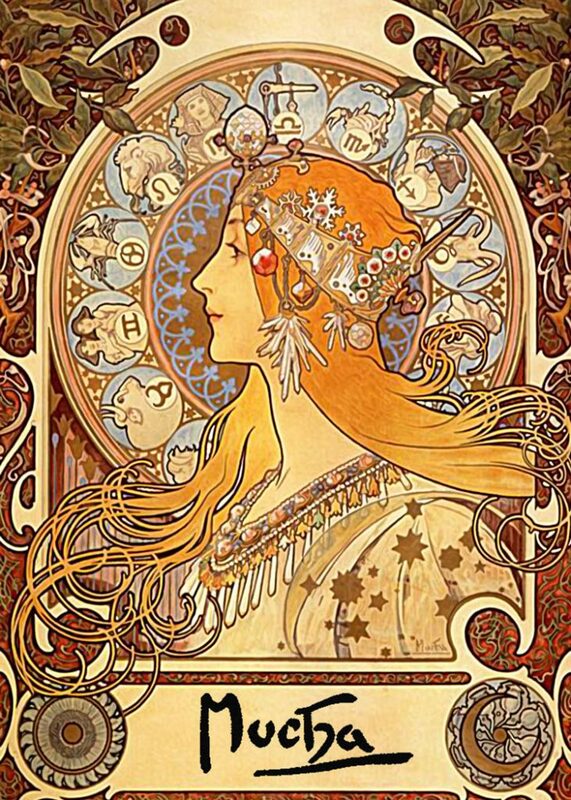 He mentioned to me that one of his favourite artists and sources of inspiration is Alphonse Mucha. Chris keeps things fairly flat and clean, with crisp edges. I don’t mean that the figures are not 3D, they certainly are, or that there is no subtlety – there certainly is. I mean that volume and subtlety are delivered in a very clean and almost graphic style. I went back through Chris’ Instagram feed all the way back to the beginning in 2015. His drawings then were good, but nowhere near the level he’s at now. Chris practises consistently. That’s where that confidence comes from – the confidence he needs to be able to draw a figure in 10 lines directly with a fineliner. 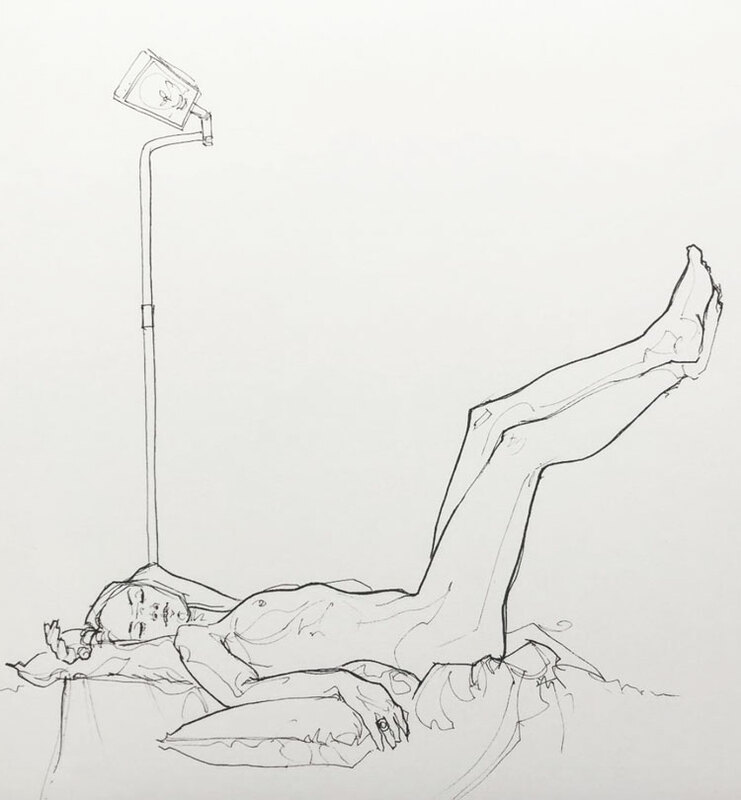 So how does he do these minimalist, expressive fineliner drawings? Step 1 – accept the possibility of failure. Don’t use a pencil underlayer, don’t build layers and correct, don’t try to force a good drawing. You don’t need all that if you have accepted that the drawing could fail. Just go for it, directly with pen, and see what happens. That’s the only way to get the freshness of line that he achieves. 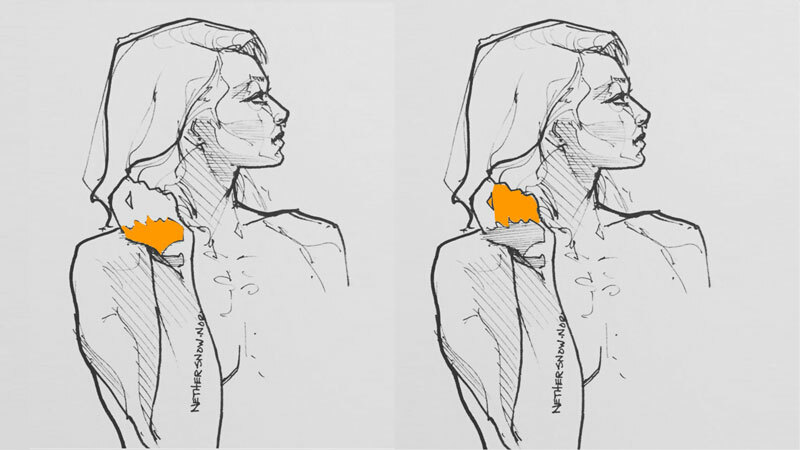 Step 2 – Observe the figure well. 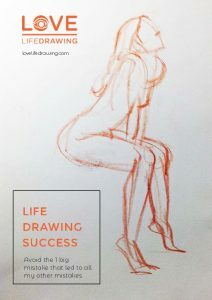 Take a moment to map out the drawing – alignments, angles and distances between important points in the figure – in your mind. 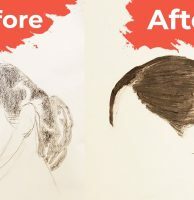 Step 3 – put down bold lines based on what you observed. Put them down like you believe in them, you mean them. They should be those that tell you only the most important things about the most important shapes in the pose. Step 4 – Take a step back every now and then to ensure scale is ok, and to ensure you are still mapping out the whole drawing. Step 5 – if it all goes wrong, do not worry. When you told yourself that it’s ok if it fails, you have to have meant it. If it goes well, rejoice. What do you think of Chris’ drawings? Let us know in the comments below. Don’t forget to subscribe to our YouTube channel and hit the like button, and sign up to our newsletter below. Thanks for reading! His use of minimalism in lines and expression work so nicely. Most certainly inspiring and a reason to keep drawing, in spite of the many failures along the way. 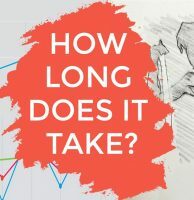 Wonderful analysis with a great lesson about accepting failure as an option – I think it is a very important part of being an artist that many tend to fight to accept. Failure is not the end, but rather a valuable step in the journey of the artist.